Purpose: In this tutorial you will learn how to set up and execute a series of calculations at different volumes for a cubic crystal. Additionally, it will be explained how to fit the energy-vs-volume curves with either polynomial of various degree or other types of equation of state in order to obtain the corresponding equilibrium volume and bulk modulus. SETUP-volume-optimization.py: Python script for generating structures at different volumes. EXECUTE-volume-optimization.sh: (Bash) shell script for running a series of exciting calculations. 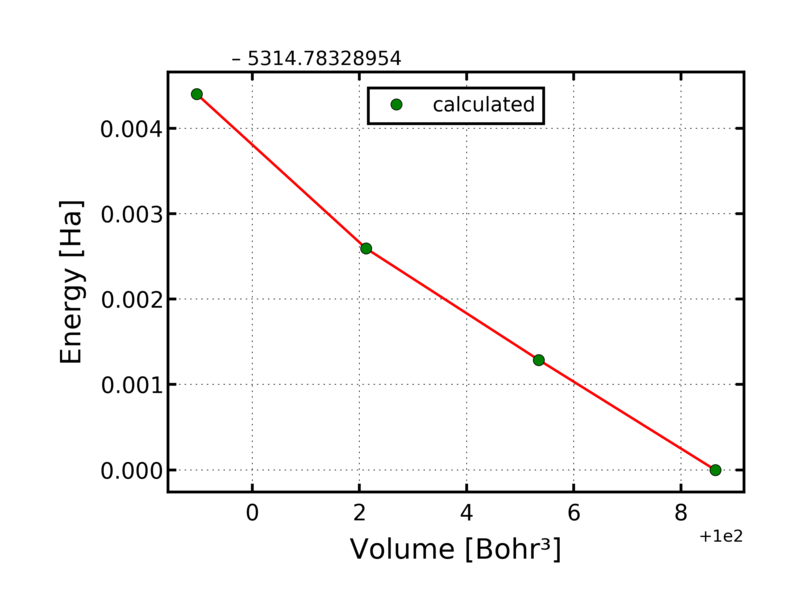 CHECKFIT-energy-vs-volume.py: Python script for fitting energy-vs-volume curves. PLOT-poly.py: Python script for fitting energy-vs-volume curves using a polynomial fit in the volume. PLOT-vinet.py: Python script for fitting energy-vs-volume curves using the Vinet equation of state. PLOT-newbirch.py: Python script for fitting energy-vs-volume curves using the Birch-Murnaghan equation of state in polynomial form. 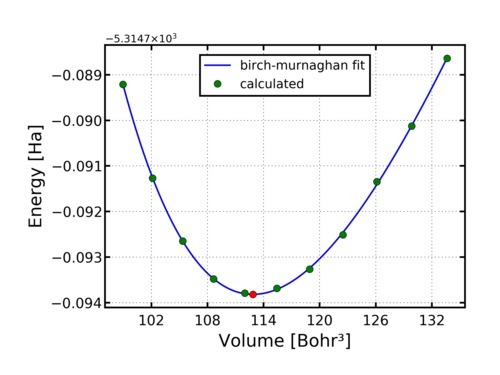 PLOT-birch.py: Python script for fitting energy-vs-volume curves using the Birch-Murnaghan equation of state. 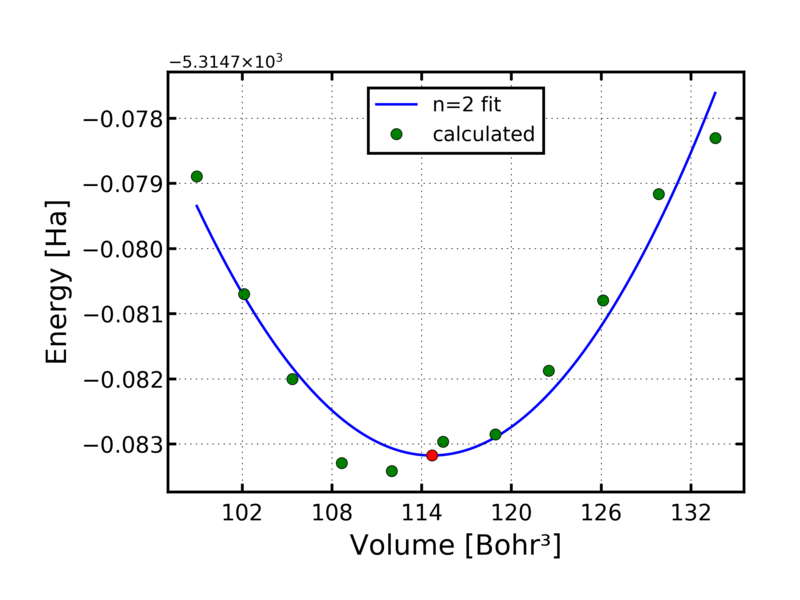 PLOT-pbirch.py: Python script for fitting pressure-vs-volume curves using the Birch-Murnaghan equation of state. PLOT-bbirch.py: Python script for fitting bulk-modulus-vs-volume curves using the Birch-Murnaghan equation of state. The first step is to create a directory for each system that you want to investigate. 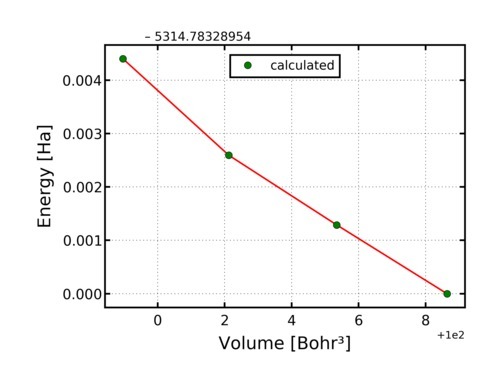 In this tutorial, we consider as an example the calculation of the energy-vs-volume curves for silver in the fcc cubic structure. Thus, we will create a directory silver-volume-optimization and we move inside it. Inside this directory, we create (or copy from a previous calculation) the file input.xml corresponding to a SCF calculation at a reference lattice constant for silver. A possible choice for this reference value is the experimental lattice constant of 7.729 Bohr. The input file could look like the following. (for further details, see Simple examples of structure optimization). In order to generate input files for a series of volumes you have to run the script SETUP-volume-optimization.py. Notice that the script SETUP-volume-optimization.py always generates a working directory containing input files for different volumes. Results of the current calculations will be also stored in the working directory. The directory name can be specified by adding the name in the command line. If no name is given, the script use the default name workdir. Very important: The working directory is overwritten each time you execute the script SETUP-volume-optimization.py. Therefore, choose different names for different calculations. The script SETUP-volume-optimization.py produces the following output on the screen. In this example, the working directory is named vol-opt-1, the (on screen) input entry is preceded by the symbol ">>>>". The entry value must be typed on the screen when requested. This entry (in our example 11) is the number of structures which are generated with equally spaced intervals of the lattice constant with a variation of between -5% and +5% from the reference lattice constant. To execute the series of calculation with input files created by SETUP-volume-optimization.py you have to run the script EXECUTE-volume-optimization.sh. If a name for the working directory has been specified, then you must give it here, too. After the complete run, the results of the calculation for the input file input-i.xml are contained in the subdirectory (of the working directory vol-opt-1) rundir-i where i is running from 01 to the total number of volumes. The data for the energy-vs-volume curve are contained in the file energy-vs-volume inside vol-opt-1. This way, you obtain both a PLOT.ps and a PLOT.png file that you can visualize using the standard tools of your operating system. Here is an example for the first 4 volumes. In order to analyse the results of the calculations, if you have not done before, you first have to move to the working directory. At this point, you can use the python script CHECKFIT-energy-vs-volume.py for performing the polynomial fit and extracting the equilibrium volume and the bulk modulus. In this example, input entries are preceded by the symbol ">>>>". Entry values must be typed on the screen when requested. The first entry (in our example 2) represents the order of the polynomial for the fit. The second entry (in our example 3) corresponds to the appropriate choice of the lattice symmetry (face-centered cubic in our example). This enables us to extract the value of the lattice constant and of the bulk modulus as reported in the screen output. The script generates two equivalent output files PLOT.ps (PostScript) and PLOT.png (Portable Network Graphics), which can be used to visualize the fitting results. An example of the script output is the following. Improve the accuracy of the fit by adding additional data points. 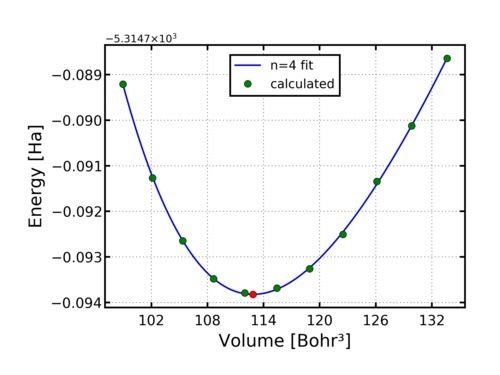 If the optimal volume is far from the middle volume in the figure, choose as a new reference lattice constant a value corresponding to the optimal volume. Check the accuracy of the calculations by choosing other values for the main computational parameters. An example, corresponding to the choice ngridk = "12 12 12", rgkmax = "8.0", and using a 4th-order polynomial fit, is the following. Compare your results with the ones obtained performing a fit using the Birch-Murnaghan equation of state. In order to do this, use the script PLOT-newbirch.py. 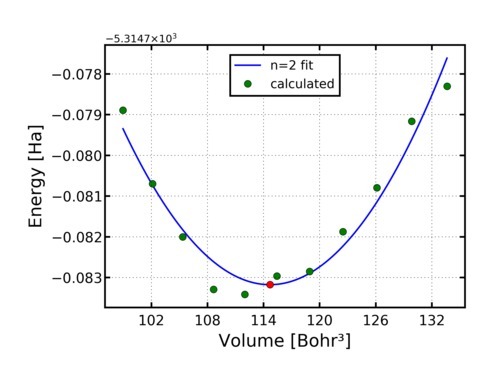 The output on the screen describes the optimal parameters for the fit, as well as a mesure of the quality of the fit (log(chi), lower values of this quantity mean better fit accuracy). The script generates the output file PLOT.png, an example can be found in the following. Compare your results with the ones obtained performing a fit using the Vinet equation of state. Compare your results with the ones obtained performing a fit using a sixth order polynomial. You may also check the effect of using polynomials of different order. Use the script PLOT-pbirch.py to visualize the comparison between the pressure calculated using the Birch-Murnaghan equation of state and the one obtained from a finite-differentiation of the calculated energies. 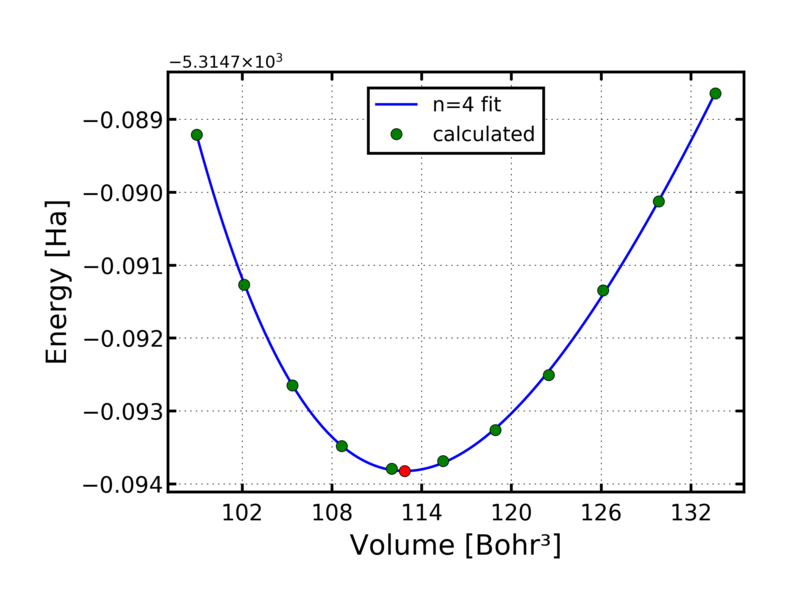 Use the script PLOT-bbirch.py to visualize the comparison between the bulk modulus calculated using the Birch-Murnaghan equation of state and a second-order finite-differentiation of the calculated energies. Choose a new cubic material and repeat all the steps.